I only played through The Darkness the once and that was many years ago. I remember it had a cool realistic look to it much like the F.E.A.R games and Condemned did. This time around the realistic look is gone replaced with cel-shading which I can understand seeing as the game is based on a comic book. The Darkness II takes place around 2 years after the events of the first game. In that time Jackie Estacado the owner of an ancient evil called amazingly enough 'The Darkness' has become don of the Franchetti crime family whilst keeping his power locked away within him. An attempted assassination attempt on Jackie at a restaurant forces him to release the darkness to save his own life. 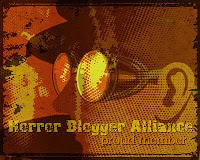 A powerful secret society calling themselves The Brotherhood led by a mutilated man named Victor want The Darkness for themselves and pursue Jackie everywhere he goes. He is further incited to defeat them when The Darkness reveals it has his dead girlfriends soul trapped in Hell and if Jackie looses the power of The Darkness he will loose her (she was killed in the first game). Periodically Jackie wakes up in an insane asylum where the Doctors suggest to him that he is hallucinating the events of the game and that he is just delusional that gives an interesting angle to things. 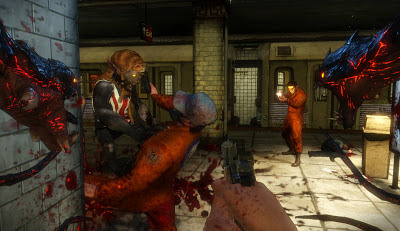 I will start by stating The Darkness II is extremely bloody, you get access to a variety of gruesome finishing moves that see your tentacles ripping apart enemies. They get their heads pulled off, sliced in half, ripped into pieces and even have their eyes gouged out all with fountains of blood. Jackie himself is subjected to various horror throughout including taking a shotgun shell to the face, run over my a train, and even imprisoned inside an Iron Maiden, so not a fun time for him. I guess the cel-shaded look means there can be more violence but I have never been a fan of that graphical style and did miss the realistic look. Gone is the hub level and various mini quests and instead you have a linear progression that is usually accessed from your mansion. In the mansion you are free to explore but you can't run in this level and so is painfully slow to get anywhere, I tended to just go straight to the next mission. The game does look fantastic but the locations are just not that interesting. A secret brothel, graveyard, abandoned amusement park; all look great but are just kinda boring truth be told. The most exciting section of the game saw you riding a ghost train for an easy shooting gallery though the whole game feels like a shooting gallery being as it is very linear. 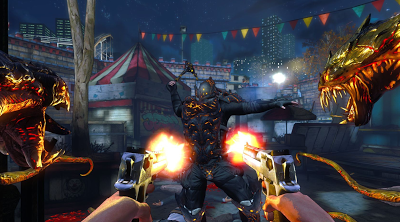 Enemies run towards you shooting or using their anti darkness tools (a whip that can take weapons out your hand, a spiked shield, light guns and light grenades etc) and are all quite easily dispatched. Jackie has the use of both guns and the darkness powers that can be levelled up by eating the hearts of dead enemies. darkness powers exist as two tentacles and can be used mainly to attack enemies and to grab objects in the environment. Lights are not your friend and need to be destroyed for your powers to work. In The Darkness destroying these lights was a large part of the game, here they are not that plentiful so you loose a lot of the element of creating the ideal playground to kill your enemies. Flames and sunlight shining through boarded windows create some variation but on the whole it can be frustrating to get caught in light. The cel-shaded nature makes it hard to tell where lights are shining, all too often I found myself getting burned up by light purely by accident. The light grenades the enemies throw are also super annoying. They wouldn't be so bad but the game also does that ridiculous thing that if your dying the screen starts to turn red so you can't see anything (I have never understood this; if your nearly dead the last thing you want is for the screen to become obscured, it can only double your chances of dying to do that). The plot is quite bare bones even if the acting is not that bad a quality, it just seemed too simple, sure you got a little motivation for revenge against the Brotherhood but nothing like in the first game. The very best part of the game is the narration done for each of the 29 hidden relics you can find. The character Johnny has a fantastic voice actor, these little stories about the relics are narrated by him, they are inventive, interesting and provide back story that is missing from the game. Another cool feature is a separate game mode called Vendetta's. In this you play as one of four characters; an Asian man with a darkness infused samurai sword, a woman with a darkness infused sawn off shotgun, a Voodoo guy with a magical staff, and an obnoxious Scots man armed with an awesome throwing axe that returns to your hand at the press of a button. I loved the Vendetta missions, they even use some new locations not seen in the main story. But, and quite a big one at that...you can only play a few of the levels in single player, a whole heap of them are locked unless you do it in multiplayer which is again frustrating for me as I am being punished for not being able to do that. 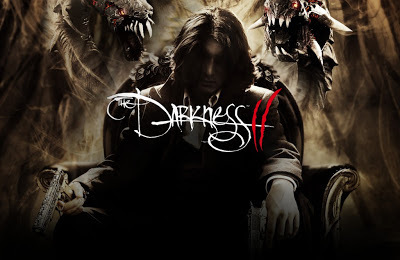 The Darkness II was as good as I thought it would be. Is nothing special but can be empowering at times. The cel-shaded graphics are not to my liking though voice acting is good. Can't see myself playing this again for a long, long time. A final note; if your not a guaranteed hit then please don't end your game on a cliffhanger, just a bit embarrassing assuming you will be around to make a sequel.